Music & Communication | Create music. Express yourself through music. Communicate to understand about music. So we finally got it finished! 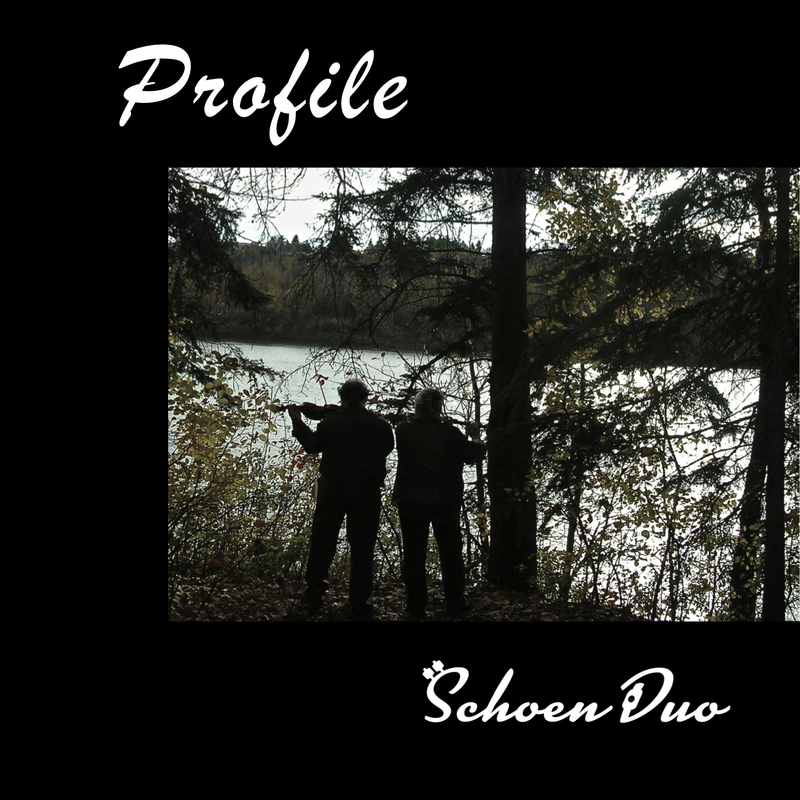 Our new EP is available now on CD Baby, and will soon also appear on iTunes and other music download sites. We have learned so much from this project that we are already starting on the next one, which will be even better. But as conceptual artist John Baldessari said, “You have to try things out. You can’t sit around, terrified of being incorrect, saying, ‘I won’t do anything until I do a masterpiece. '” So its out there – check it out! I have always been aware of the Suzuki program in Peru. In 2000, when I took my first SAA teacher training class (Recorder Unit 1A, at Kent State University in Ohio), there were teachers from Canada, Great Britain, and the United States, and students from the United States and Peru. The first time I was involved in coordinating the Recorder Consort program at the SAA Conference in Minneapolis, one third of the students in the Consort were from Canada, one third from the U.S., and one third were from Peru. I followed with interest the articles in the ASJ that described the Suzuki Festivals in Latin America, and one that seemed to be mentioned most often was the one in Peru. As I took more teacher training classes, I met more people who had traveled to South America to teach, and many of them told me wonderful stories about teaching in Peru. When I went to the Leadership Retreat, Caroline Fraser showed me a video of a recorder student playing at a very high level at a festival in Peru. When I was asked if I could be available to teach at the International Suzuki Festival in Lima, I jumped at the chance to see for myself what was happing in Peru. I did have some initial concerns about teaching in a foreign country and in a foreign language for the first time. Quizzing colleagues about what to expect resulted in many useful pointers and lots of reassurance: “Don’t worry, you’ll do fine.” After getting up at 3 am to get to the airport and traveling for 20 hours, I looked at the customs & immigration card the flight attendant had just handed me and wondered if that was going to be true. According to this card, I was only allowed to being one musical instrument into the country. Only one? I play and teach recorder! I was traveling with a full consort of 5 plastic recorders (sopranino, soprano, alto, tenor, and bass) in my checked bag, as well as a couple of wooden altos and sopranos (renaissance and baroque) in my carry on bag. What to do? I left that portion of the card blank, and asked the person who checked my passport as I cleared customs. She directed me to the next person, who took the card from me without noticing that I had left that part blank. I sighed with relief. “OK, so I guess it doesn’t matter.” Then I turned to leave, and discovered that my bag had to pass through another Xray machine before I could leave the airport! I turned back to the official who took my card. “I left this part blank because I had a question…” He glanced at me: “You are a tourist, and you only have one bag. You do not have a problem.” And so I didn’t. My bags passed the Xray test without any comment, and I was officially in Peru with all my instruments. The “no problem” attitude prevailed throughout the entire festival. Did a student not have a parent available to accompany him? No problem, have the students come as a group with one or two chaperones. Did some students not have transportation? No problem, all the students from that part of town will come in a bus all together, and wait for each other to return together at the end of their classes. Did one of the teachers have to teach a masterclass at the same time as his teacher training unit? No problem, we’ll just take our break at that time so he can still fulfill his attendance requirement. Is there a shortage of music stands? No problem, we’ll just tape our parts to the back of the person playing in front of us. Did a student have difficulty reading his chamber music part? He worked hard at home and came back to the festival the next year reading complex music, no problem. This “no problem” attitude was just one symptom of the abundance mentality that prevailed at the Festival. . The general feeling was that there is enough opportunity for everyone, and every child can, despite scarce resources, so we all help each other because we know there will be enough for everyone and we can all grow and learn together. Many teachers were taking training in more than one instrument, in order to provide more opportunities for more students. This was a sharp contrast to the scarcity mentality that I sometimes run across in my home community, where the need to be with the “best” teacher turns into a race to grab as much as quickly as possible so my child gets the most opportunities and can progress faster than the other students. Even though we have more resources than many other communities the attitude sometimes becomes one of competing for those resources rather than sharing them. At the Lima festival, the cooperative attitude was even present in the pre-concert “noodling”. If one person started reviewing a piece, other students and teachers who were familiar with that piece would join in, and suddenly an impromptu group class would form as they all reviewed the piece together. One of the issues that could easily become a problem for teachers and students to attend the festival was travel. The distances and expenses involved in getting there for many people were similar to that which I am familiar with in Canada (with the additional issue of the paperwork required for international travel, depending on country of origin,) so I was very interested to see how they coped with these issues. There isn’t much you can do do to reduce the distance and cost, but what you can do is make the experience once you get there as rich as possible to make it worth the effort and expense. So on the very first day when we gathered for the opening concert and faculty introductions, all the people there who came from different countries and districts were acknowledged and applauded. This acknowledgement was repeated at all the concerts and events. Later in the festival, at the Latin American concert, groups from each country performed together, walking on stage under the banner of their respective national flags to uproarious applause. The acknowledgement of the effort people made to come from great distances was also reflected in the organization of the Festival. The teachers’ conference, or ”Ecuentro” was scheduled on the weekend in between the two weeks of Festival classes, so that teachers could attend both events while they were there. Instead of offering SPA or the Practicum as a separate course, a “Teaching Strategies” course was provided at the end of each Book unit to provide extra training in the practical application of what had just been learned that week. So the teachers were able to take a book unit course, have a mini-practicum, and attend a conference but only have the expense of one trip. The opportunity to share and learn together was celebrated at every opportunity. Photographs were taken to commemorate every event. Not only was there an official photographer for the entire Festival, there were special times set aside in the festival schedule for people to congregate to take photos of their class and instrument groups. The students who did not have cameras mobbed their teachers for commemorative autographs on their festival programs, folders, and Suzuki books. Certificates were presented to all the participants, both students and teachers, and the teachers had a special presentation ceremony that was attended by everyone who took a teacher training course that week. All the participants cheered each other on for completing each course. The feeling was that attending the Festival was a major life event, like a wedding, birthday, or school graduation, and as such it deserved to be commemorated with similar ceremonies, certificates, and photographs. A group of Peruvian recorder players demonstrating that a shortage of music stands is not a problem. photo credit: Sergio Aguilar, Festival Internacional Suzuki, Lima, Peru. Being part of the the International Suzuki Festival in Lima, Peru, was certainly a major life event for me. There are things from that experience that I want to bring back to my home community. I am inspired to create more opportunities to celebrate what we are doing, for both students and teachers! I want to create an abundance mentality in my home program that not only will promote more sharing and support between families, but also extend out to helping Suzuki programs in areas where they have fewer material resources. I am encouraged to continue with ongoing projects to increase accessibility to Suzuki instruction in isolated areas of my own country, and I sense possibilities for more international cooperation and communication in the group of recorder teachers who have been staying for an extra week after the SAA Conference to take teacher training together. 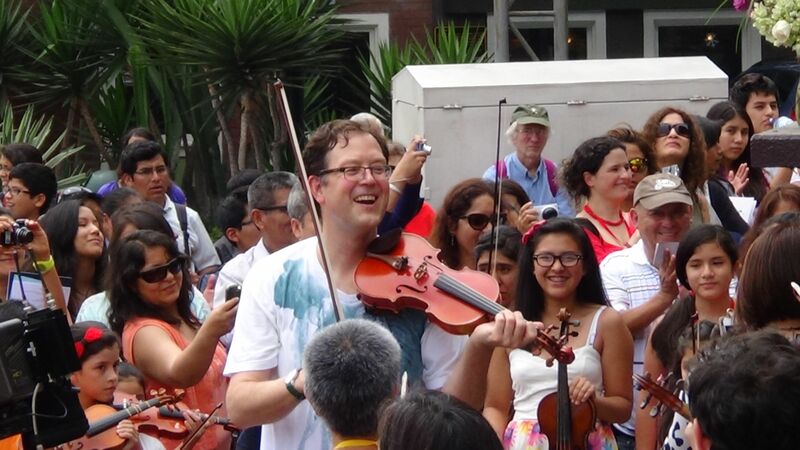 But most of all, I want more people to be be able to feel what I felt when I was performing a song from Quebec in a school gym in Peru with a group of teachers and students from every county in between – maybe music can save the world! So my idea of posting daily blog updates has been revised due to the unreliability of the internet connections, but I am now back after a pause to reorganize my communications. 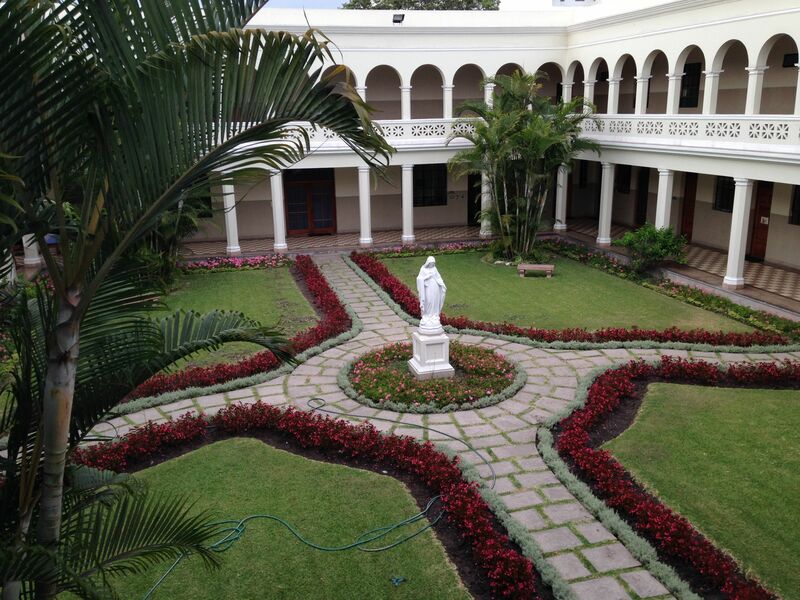 (First world problems 🙂 ) At the school where I am teaching my classroom door opens into an open gallery that overlooks this lovely courtyard, with a formal garden complete with palm trees. Opening concert of the 29th Festival Internacional Suzuki de Musica in Peru. The recorder students from Huancavelica played a set of traditional melodies in memoriam for Monseigneur Molloy who died earlier this year. The Monseigneur had started the music program there 30 years ago.